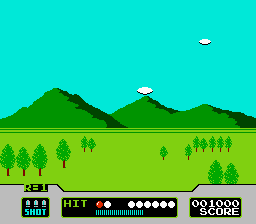 Duck Hunt is a shooting game that requires the NES Zapper. Shoot the ducks out of the sky and your faithful hunting dog will fetch them for you. Alternatively, why not take part in a spot of clay pigeon shooting? 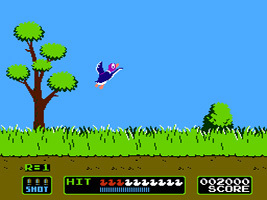 A second player can join in by controlling the ducks while the first player tries to shoot them down. 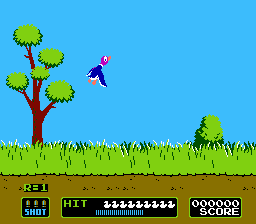 A duck flies around in the sky and you have to shoot it down. You only have three shots for each duck, and a limited time to hit it before it flies away. The bullets you have remaining at the end of a round will be tallied up for bonus points. Different coloured ducks move at different speeds. The rules are the same as Game A, only there are two ducks you have to shoot down. You still only have three bullets to clear them both. Clay Pigeons are fired over your head into the distance, and you have to hit them out of the sky with three shots. In later rounds the clay pigeons move faster.